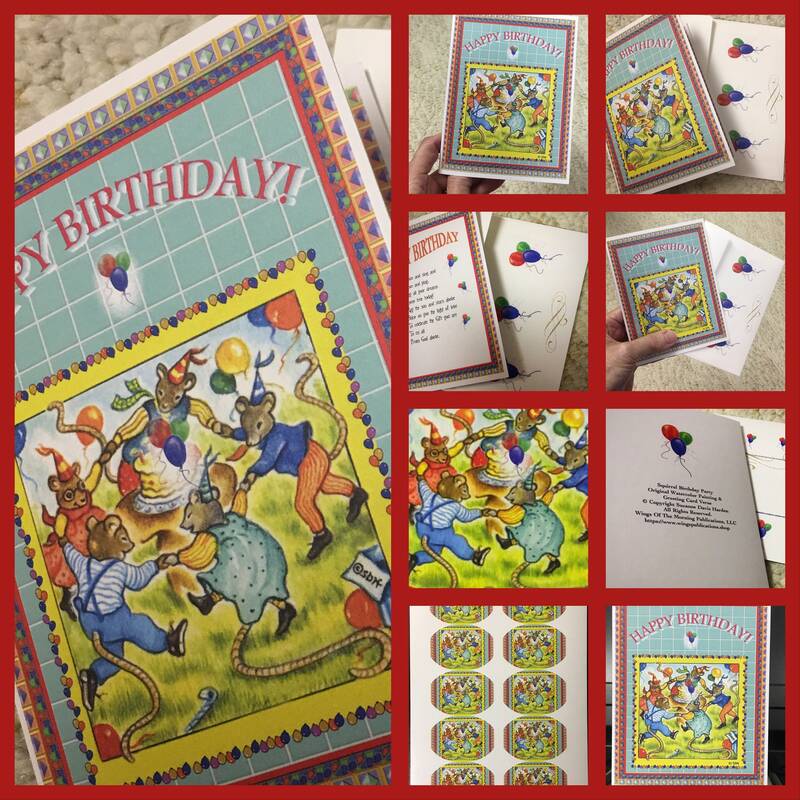 Set of two original Happy Birthday Party Greeting cards and matching illustrated envelopes featuring a joyful party of little friends celebrating with colorful balloons, hats, birthday cake, and more! 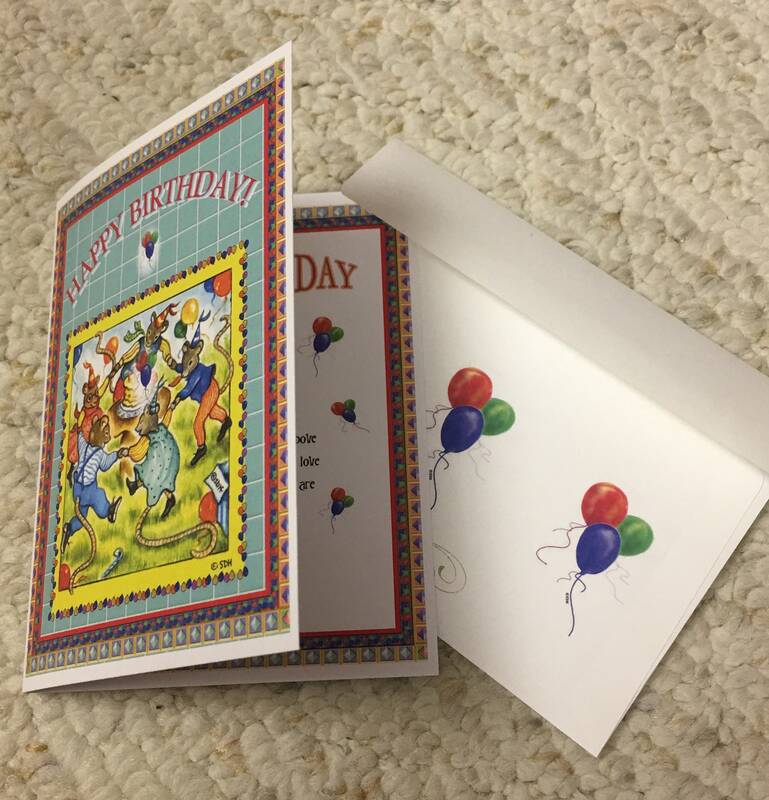 leaving the left side of the card blank for your personal message to your recipient. 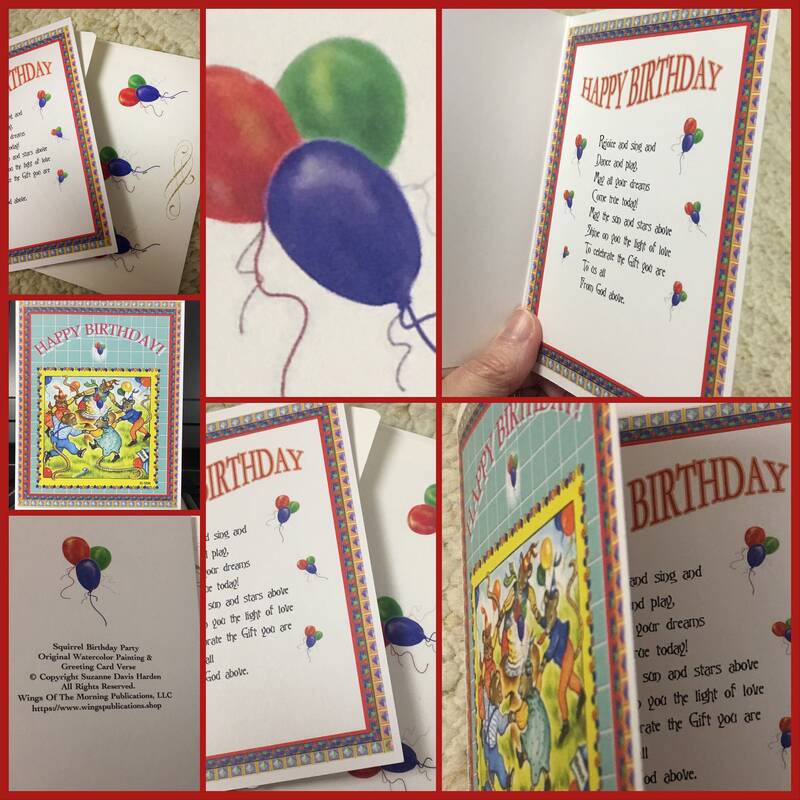 These are joyful cards to send to friends or loved ones, whether child or adult, to honor them on their birthday. 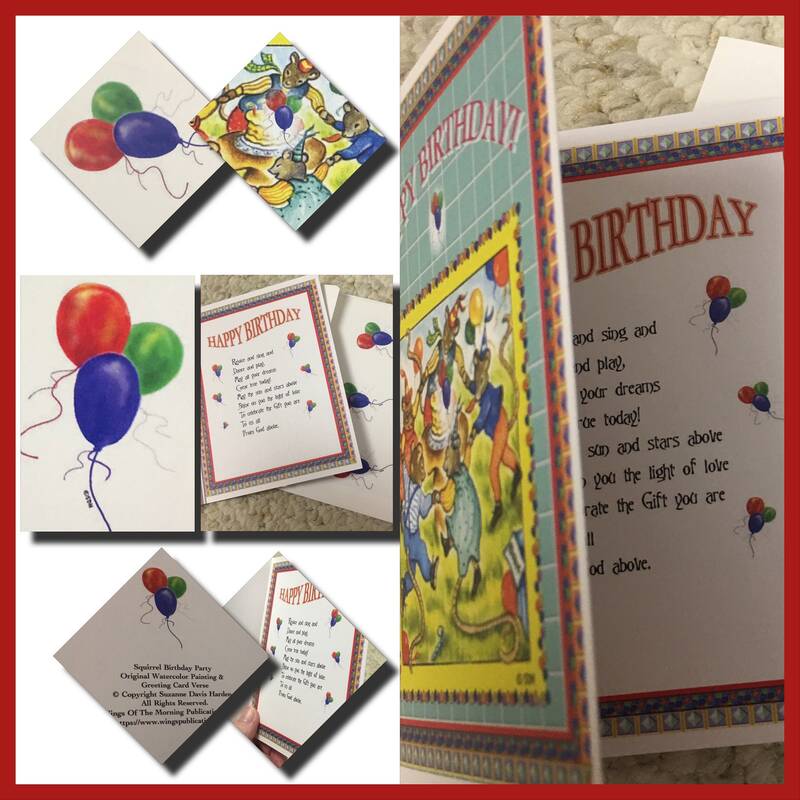 *Cards are printed on sturdy quality card stock. 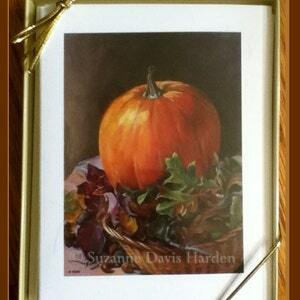 *They measure 5” inches x 4 1/2” inches. *They come with matching illustrated envelopes. 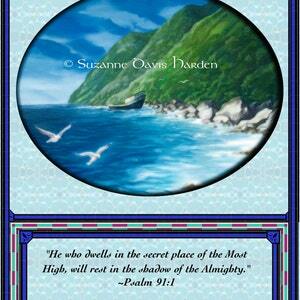 *Cards and Envelopes are shipped in resealable sleeves. In the illustration on my Squirrel Birthday Party card, the little mice have all joined hands to celebrate, support, and honor their Squirrel friend’s life with love, laughter, and great joy. But wait! 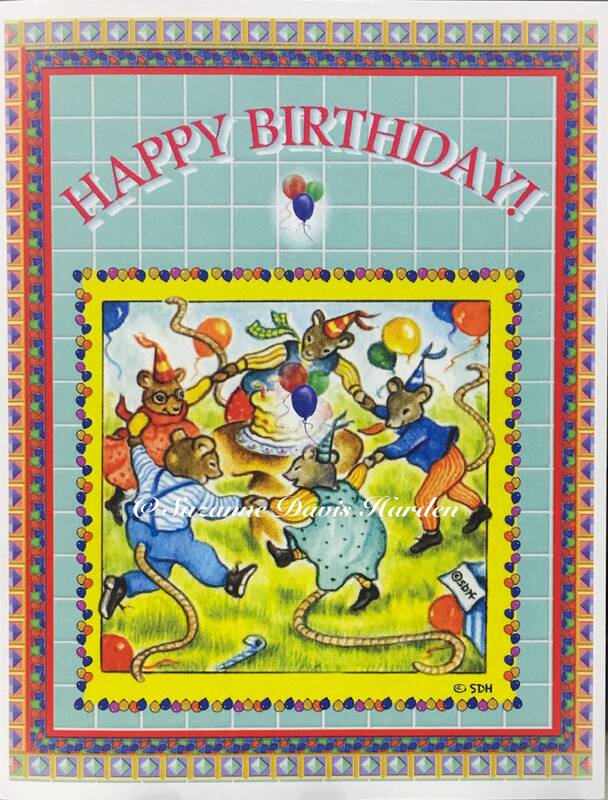 Where is the Birthday Squirrel in the card? Only the mice are pictured in the Illustration. This is because the Birthday Squirrel was not able to attend his party that day for he was sick. The little friends decided that they would honor their friend anyway. They all gathered together, brought cake and ice cream, and danced and sang songs to celebrate their friend. Then they carried some cake and his gifts over to his house to encourage him. 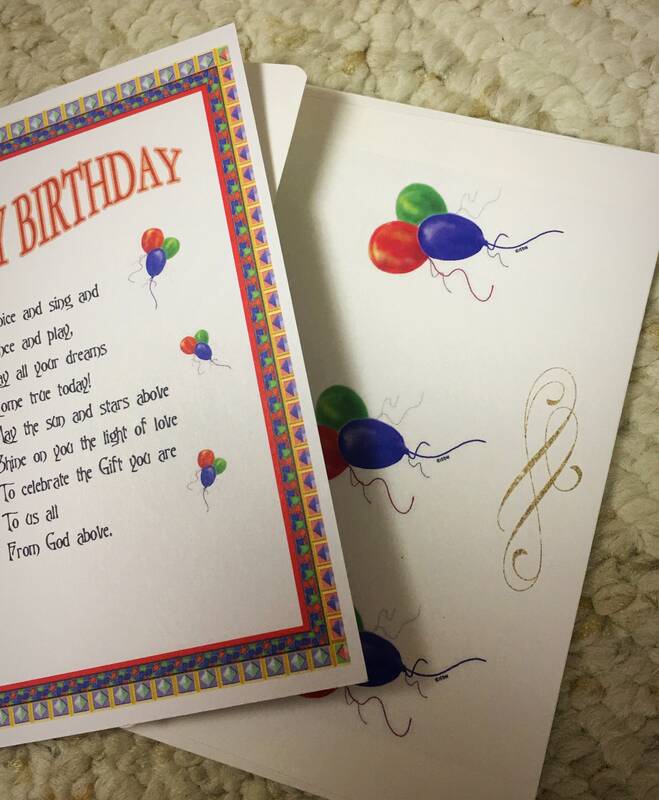 What do “Love” and “Prayer” have to do with Birthday Cards? 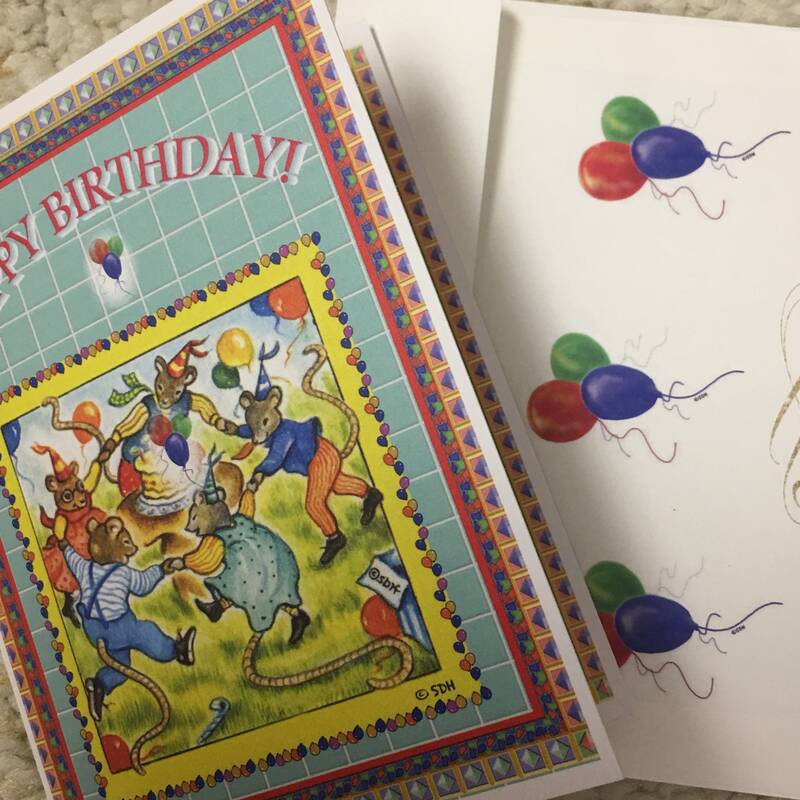 Think what a Birthday card represents! 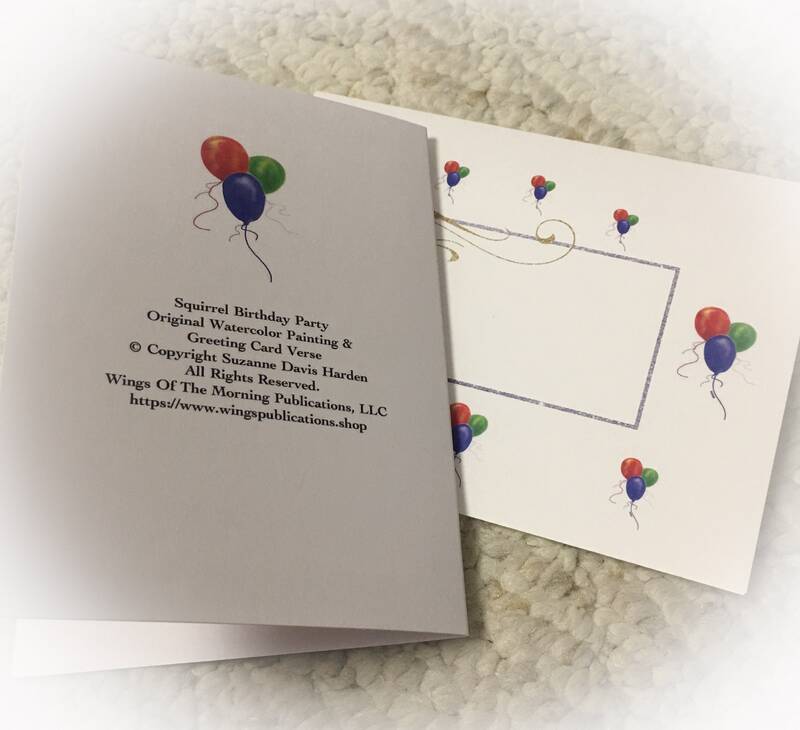 It is a card we give to someone in honor of their life, to celebrate the day of their birth, the day that they came into existence as a human being. 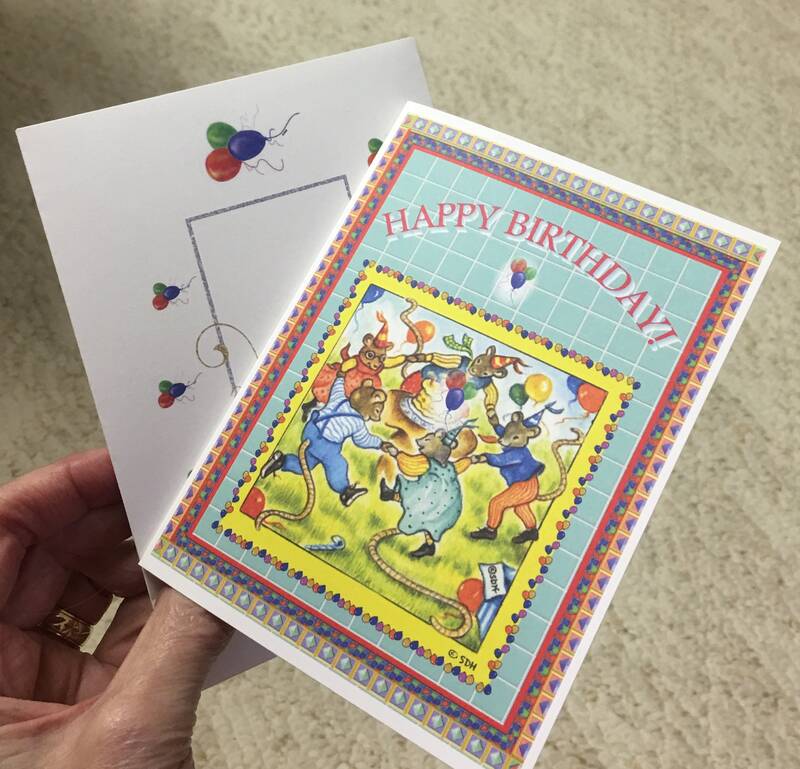 Sadly, some people may receive no card on their birthday. They may never say it aloud, but deep inside they may feel forgotten and not valued when people neglect to remember them. 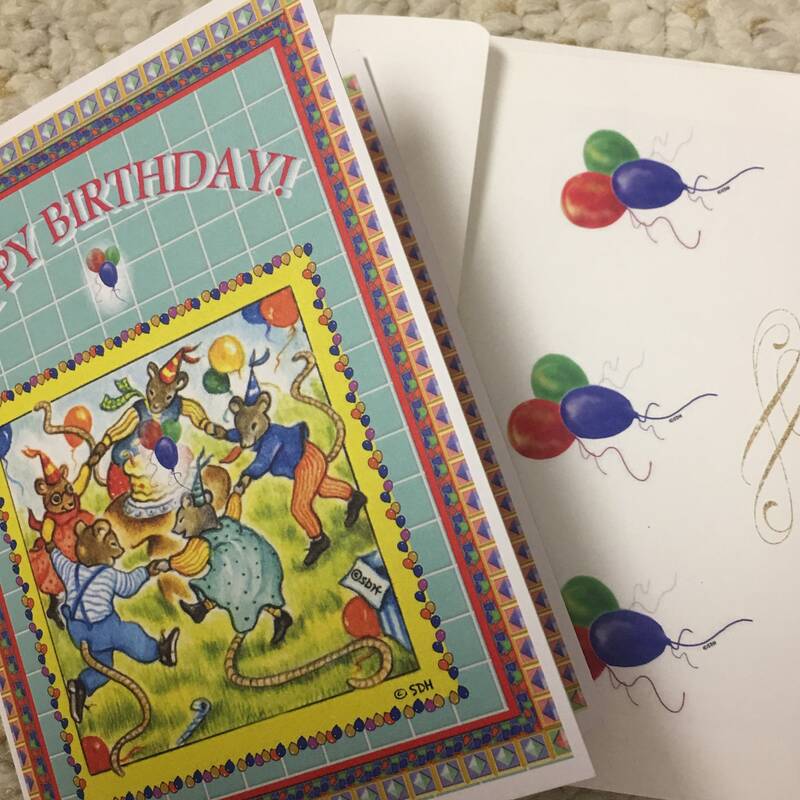 A simple card, whether sent to someone to honor their birthday, to encourage them, to show them that they are important to us and not forgotten, is an expression of love. 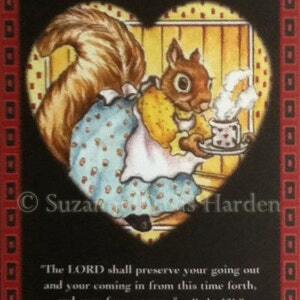 Consider also that a prayer for a person is like a spiritual greeting card, but it is sent up to God on their behalf. Prayer blesses both God and the person we pray for. 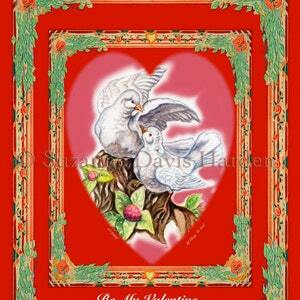 Like the physical greeting card we send to someone, sending a prayer to God for others is an act of selfless love. It costs us something to love others; our time, our energy, our will, and if we purchase a gift, our money. For true love involves a sacrifice. Jesus asked us to lay our lives down for each other, to love them as He loves us. It is very important to take time every day to pray and ask the Lord Jesus to show us how He wants us to share His love. As we yield our heart to Him, He will guide us. Whether the Lord leads us to pray, send a card, make a visit, a text or a phone call, may we do whatever act of love He inspires in our heart. For then our life will be a beautiful blessing of joy and light, and a reflection of Christ to all around us!